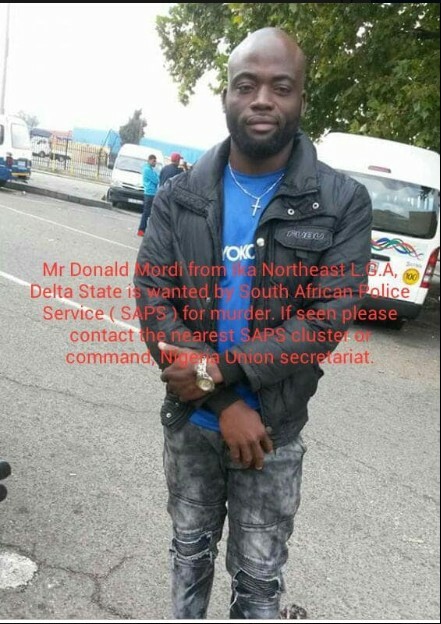 According to Eze Ndigbo in South Africa, a Nigerian man identified as Mr Donald Mordi has been declared wanted by South African police for alleged killings. The suspect, who is from the Ika local government area in northeastern Delta State, reportedly killed a Nigerian colleague on sectarian issues before fleeing. In addition, the presidency said that Nigerians killed in South Africa have recently reported that they were killed by Nigerians, unlike the past when South Africans killed Nigerians. The Special Assistant to the President in charge of Foreign Affairs and Diaspora, Abike Dabiri-Erewa, said that the intervention of President Muhammadu Buhari had changed the previous situation. "The last three killings have been Nigerian killing Nigerians, some worrying and a more dangerous trend: Six policemen involved in the killing of Nigerians over the years have recently been brought to justice and the Nigerian embassy is following suit. close the cases in court. "The Nigerian government will continue to demand justice for the killings, but this element of Nigerians' deaths in another country will only complicate matters." Dabiri added, "This is the first time that police have been prosecuted for killings resulting from the persistent intervention of President Muhammadu Buhari's administration in the matter." The Nigerian involved in the killing was arrested. she concluded.